Following this, it’s becoming increasingly important for UK organisations to build a robust and effective candidate attraction strategy. The following guide pursues a variety of actions that can help to improve your candidate attraction strategy and land that perfect hire. When you have a low unemployment rate and a growing economy, it’s a job seeker’s market. In July, the UK employment rate was 74.9%, the highest since comparable records began in 1971 (Office for National Statistics). In employment terms, this is known as ‘the war for talent’, whereby UK businesses are in a dog-eat-dog struggle, fighting for the best signatures to bolster their teams. In order to stand out from competing organisations, companies are now focusing on developing and building lucrative candidate attraction strategies and ensure the best candidates (both active and passive) are keen to join their ranks. Employers need to demonstrate, more than ever, why they are the company to work for. In this time of struggle, failure to act may result in an inability to grow, and even meet existing demand, ultimately resulting in poor customer and investor relations. 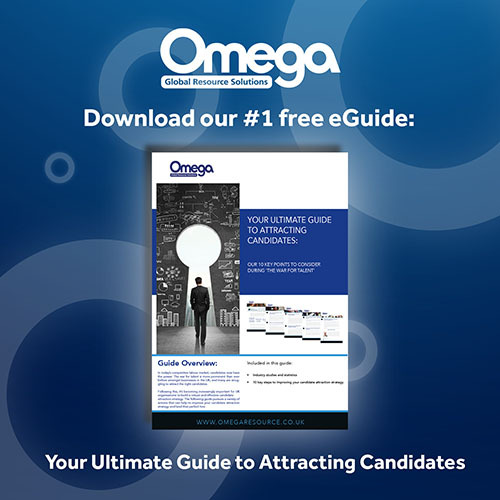 This guide is designed to help you understand why a robust candidate attraction strategy is essential to any business, and, to make it easier for you, we’ve included ten of our key steps to consider when attracting candidates. The UK has a world-class advanced manufacturing and engineering industry that is part of our industrial heritage and Omega Resource Group proudly serve. Cyber…What is all the fuss really about?